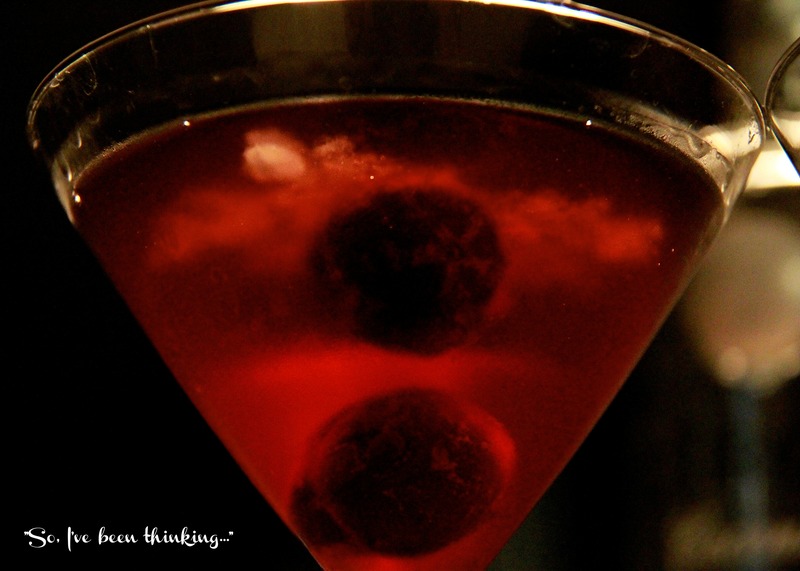 Cherry Coconut Martini - "So, I've been thinking..."
I was going to call this Cherry Coconut Martini a Valentine’s cocktail – it has all the makings: it’s red, it’s delicious and I’m posting the recipe right before Valentine’s Day. Also, if you have two, you will be in love with everyone. This drink came about simply enough – Greg and I have friends we have dinner with regularly. There’s a pretty big group of us and whenever we get together we are always trying or creating a new drink. 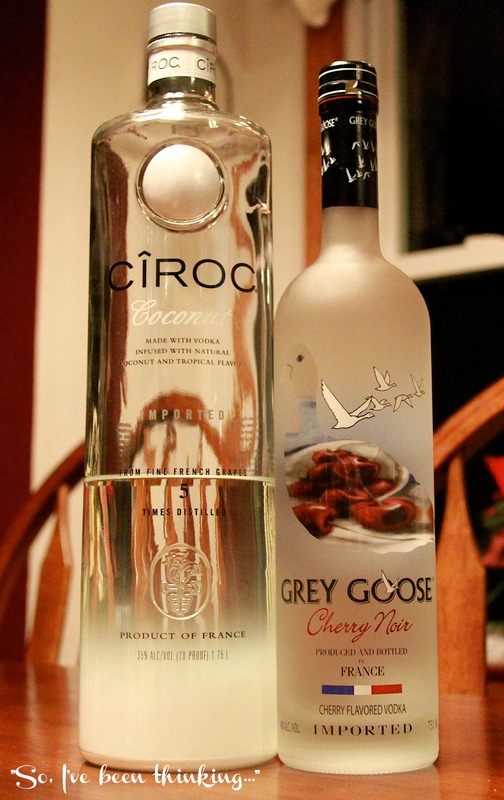 Coconut Ciroc has long been a favorite vodka and that was the basis for our drink one night. We’d been mixing this Ciroc with pineapple, fresh pineapple chunks, fresh mango, lime and various other fruits (recipes for another day?) during the summer but it wasn’t summer anymore and we wanted a “cool weather” drink. I’ll be honest, when my friend suggested mixing coconut with cherry I was a little hesitant. I couldn’t imagine what that combo would taste like. 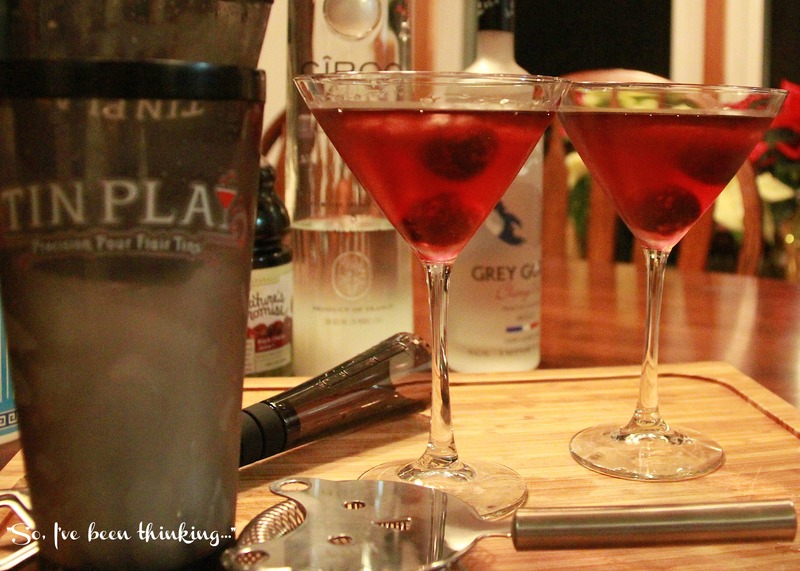 This is a good simple variation of the martini, easy to make and not a lot of mess. I kept thinking it was missing something though. 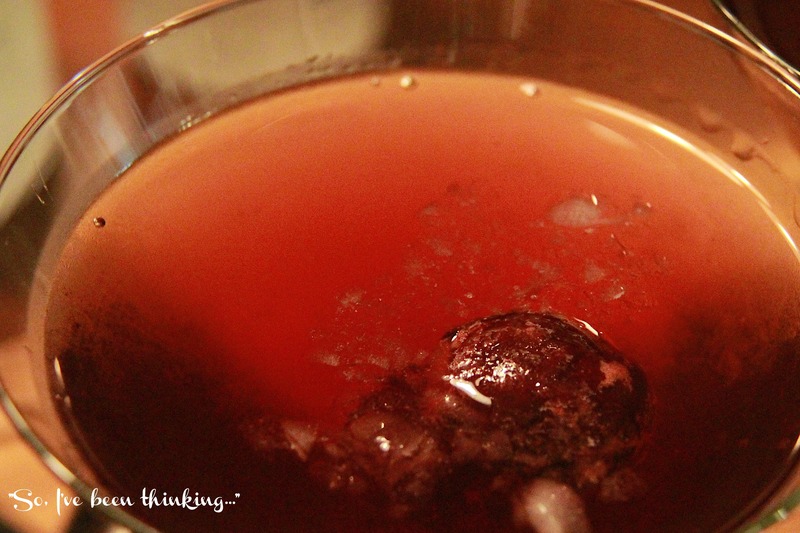 Whenever I’d drink this cocktail I’d wait for the cherries to melt a little and squish them into the drink. You may be a step ahead of me already, but I didn’t know you could buy black cherry juice. Not “kool-aid” just real cherry juice. Once I found out about the juice and found a secret ingredient I hadn’t thought of before – this cocktail went from good to amazing! 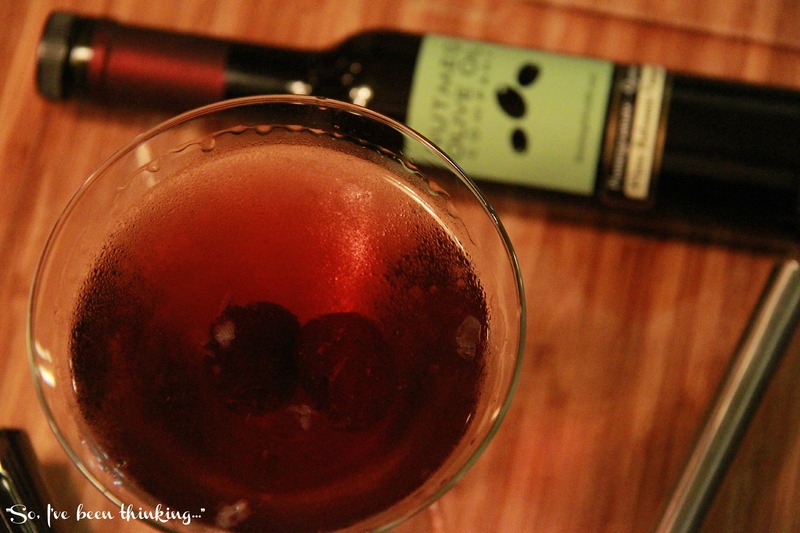 This martini has the tartness of the cherries and cherry vodka but it’s smoothed out by the sweetness of the coconut. It’s on the sweet-ish side which is how I ended up with the secret ingredient. If you don’t have pomegranate quince white balsamic vinegar specifically, don’t worry. You can leave it out and add more lemon or lime if you prefer. If you have another fruit & white balsamic vinegar – try what you’ve got. It’s not going to make or break the cocktail either way but if you want to add a “layer of flavor” I suggest you try it. Variations:Â If you want to make a batch of this martini you can change the ounces to cups and serve from a pitcher. If you want it lighter/less “pure alcohol” serve over ice and add seltzer (cherry seltzer is great with this) to each individual drink, not to the pitcher. So, now that you know what I’m having for Valentine’s Day (after hockey practice and a basketball game – both very romantic) and what I’ll be listening to, what are you making? 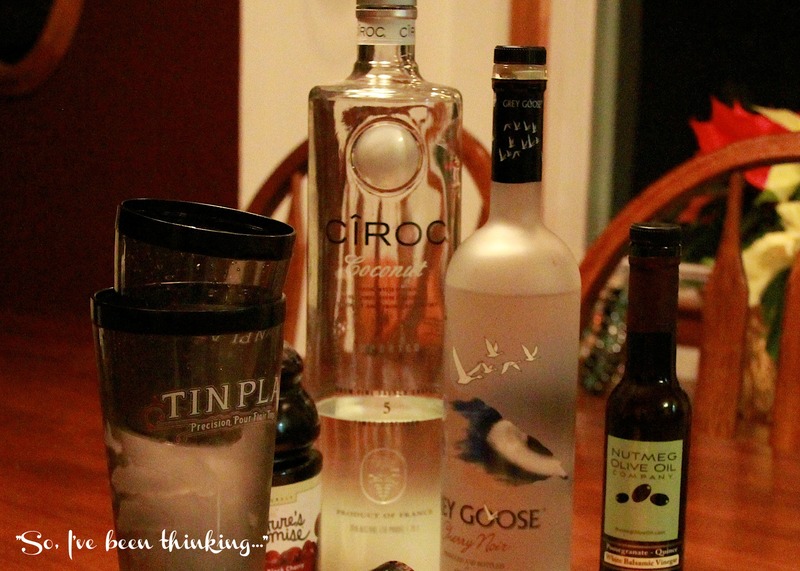 Are you trying a new cocktail or dinner recipe? I’d love to hear all about it! I’m thinking I will be over in 10 minutes to try some of that! oh yummy looking!! You’ll have to settle for “mommy peach tea” (another recipe) because I’m out of the Coconut for some reason. hmmmm, imagine how much more I’ll be out of if we don’t have school tomorrow either. I want one right now!! After all, every day is Valentine’s Day, isn’t it?? Ha ha. I’ll have to wait out the snow too, as I stubbornly became ill-prepared. I’m not even prepared for this deliciousness…I’ve got to wait it out too. Wishful thinking. This does look amazing! Of course I don’t think I have ever had a drink that you made that I did not like. You are the queen! I’m thinking we’re in for another snow day tomorrow, so I am about ready for a drink too. I think I have leftover wine from last night…I am going to have to settle for that right now. You were right. Snow, snow everywhere! I will make you one of these for sure – once we dig ourselves out. Let me know what you think when you do try it. Thanks for pinning! Ok, I need that. I love cherry everything. And I really, really will need a nice drink after this week. Everyone needs one of these. Especially after all this snow. It’s the only thing that will help being inside this long bearable. Oh, does this look good! 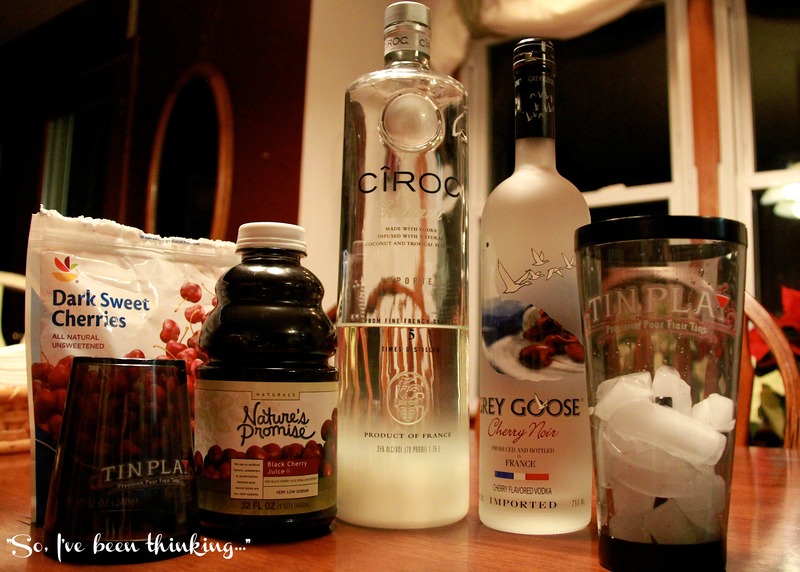 And the seltzer idea is a great one! I may have to start a separate pin board for your drink ideas! That looks good! What are you doing later??? ?